You will be amazed by the number of things you've done simply because you wanted to belong. You didn't want to be left out. 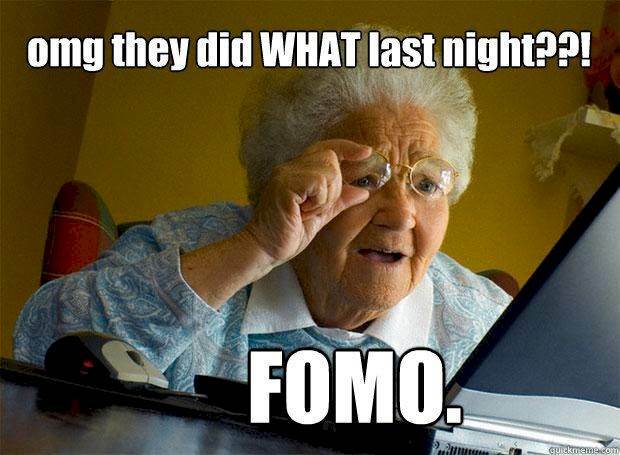 You had what is officially known as FOMO -- Fear Of Missing Out. And technology is making it more endemic. People waste hours a day on Facebook just to keep tab on what others are doing. A lot of people's activities on Twitter are simply catching up with the Joneses. It is now increasingly hard to rise above the noise we constantly expose ourselves to. I even hear there are now many ladies who daily read BellaNaija just to not miss out of the newest wedding dresses trend. I consider it the height of the fear of missing out. What is not obvious to most people is that when you spend a lot of time trying to keep up with what others are doing and wanting to belong, you have little time left to make strategic long term plans about your life. You also run the risk of being like everyone else. It becomes very hard to see beyond what others are doing. You fill your head with too much distracting information and your life becomes less focused. The fear of missing out is the result of a habit. It is very easy to fix or get rid of. You just have to get rid of the causative habit. Stop monitoring the lives of your friends on Facebook. Stop wasting time with meaningless Twitter fights and trending hashtag activities. Stop trying to be like everyone you envy. Start thinking strategically about your life -- evaluating your current state, accessible resources, strengths, life goals and opportunities. Start thinking like a chess player -- beyond the next move. The problem with reading too much about others and following celebrities and every friendly person around you is that you will start having impossible desires. You will start thinking about what it would be like to be as popular as Kim Kardashian or Justin Bieber and what it would be like to be as powerful as Barack Obama and what it would be like to be as rich as Dangote and what it would be like to travel a lot like your globetrotting Facebook friend and what it would be like to be as fast as Usain Bolt and what it would be like to fight like Floyd Mayweather and what it would be in Korede Bello's shoes and what it would be like to be a Saudi Prince. They might not sound as a big deal but when you have many of those thoughts occasionally popping into your mind, you will start living a less motivated life and not consider any one goal big enough to pursue with extreme diligence. I mean it would be hard to be laser focused and strategic. There is this quote I'll never forget -- "The man who tries to set the world on fire will always come back home for more matchsticks." You can't be everything to everyone and you can't be as good as everyone. You have to pick something specific to do and focus on it. You have to ignore the noise around you. It is the man who is focused that the world makes chance for, not the one trying to belong everywhere.